Copyright: © 2017 Mirek S, et al. This is an open access article distributed under the Creative Commons Attribution License, which permits unrestricted use, distribution, and reproduction in any medium, provided the original work is properly cited. Acknowledgments: We would like to acknowledge Spacelabsheathcare® for the use of the USCOM™ device, the clinical research direction of university hospital of Dijon for financial help and technical help in interpreting data. Chest compression is the fundamental technique in cardiopulmonary resuscitation (CPR) in patients with cardiac arrest . The quality and the early implementation of CPR are essential to improve the prognosis and the chances of restoring spontaneous circulation. In the literature, there are some articles about the poor quality of chest compression [2-4]. Therefore chest compression is as crucial as alerting the emergency services or early defibrillation in the survival chain. In accordance with the guidelines, chest compressions have to be performed continuously to improve the outcome . However, the efficacy of manual chest compression diminishes over time with the fatigue of the provider (which appears within minutes of starting the procedure), and is impaired during transportation manoeuvres, which expose patients to unforeseen interruptions and a deterioration in the quality du massage in terms of power and rhythm. The efficacy of manual chest compression has been reported to fall by 20% per minute [6,7]. Mechanical chest compression overcome this problem of operator fatigue by ensuring constant efficacy in terms of both quality and quantity. Even though current data show no difference between manual chest compression and automated systems in terms of survival, haemodynamic studies in animal models have shown that mechanical techniques are more effective . The principal aim of this study was to evaluate the hemodynamic impact (systolic, diastolic and mean arterial blood pressure) of the LUCAS™ active compression-decompression device (Medtronics® Jolife; Lund, Sweden) as the mechanical chest compression technique versus manual chest compression. The secondary aims were on the one hand to evaluate in a quantitative manner cardiac output and its evolution during mechanical and manual cardiopulmonary resuscitation and on the other hand to evaluate the correlation between cardiac output and other routinely-measured hemodynamic parameters, in particular the EtCO2. Status epilepticus (SE) is defined as continuous seizure activity of at least 30 min duration or intermittent seizure activity of at least 30 min duration during which consciousness is not regained. Status epilepticus can be classified as generalized or partial seizures and either convulsive or non-convulsive in nature . This was a single-centre pre-hospital, prospective, study conducted between February 2011 and June 2012 by the emergency medical services (EMS) of Dijon University Hospital. The cardio-pulmonary resuscitation could be performed by a fire brigade in the first time and in a second time by pre-hospital medical emergency team (SMUR= Service Mobile d’Urgence et de Réanimation). The French SAMU/SMUR system is well described in the literature [9,10] (SAMU= Service d’Aide Médicale Urgente). Each patient was his/her own control. The inclusion criteria for the study were patients aged more than 18 years, who had suffered non-traumatic cardiac arrest, occurring in the presence of a witness, and refractory to CPR-that is to say without recovery of spontaneous cardiac activity within five minutes after the start of specialized CPR. The criteria for refractory cardiac arrest we used are the same as those used in the study by Duchateau et al, ICM 2010 : refractory out-of-hospital CA despite having had adequate CPR: no ROSC in the time interval during which the patient was intubated, had an IV line, received epinephrine and had an arterial catheter . Cardiac arrests occurring in post-partum women and in patients with a contra-indication for or failed insertion of an arterial catheter were excluded. Authorization was obtained from the regional ethics committee (CPP n°2011-02) and the medical safety authority (AFSSAPS) (n°2010-A01450639). All patients benefited first from manual chest compression followed by CPR with the LUCAS™ mechanical device (Figure 1). The medical CPR was carried out strictly in accordance with the latest recommendations for the management of cardiac arrest . All patients thus benefited from endotracheal intubation using a Boussignac™ tube , peripheral venous access, EtCO2 monitoring, and the administration of epinephrine and/or external electric shock depending on the rhythm observed. Once these measures had been implemented and according to usual practices of the service, a femoral artery catheter  saws inserted during the mechanical chest compression for the invasive monitoring of arterial pressure. The ventilation was standardized by using constant flow insufflation of oxygen via the Boussignac™ tube . Cardiac output and the cardiac index were also monitored using a USCOM™ (Ultrasonic cardiac output monitor, Spacelabshealthcare®; Sydney, Australia). Patients were included at this stage, after insertion of the arterial catheter. Hemodynamic parameters included three simultaneous measurements of systolic (SAP), diastolic (DAP) and mean (MAP) arterial pressure, and the end tidal CO2 (EtCO2) were recorded at 1 minute intervals. Then the LUCAS system was started and three new measurements of the same parameters at one-minute intervals were recorded (Figure 1). Cardiac output and the cardiac index were also monitored using a USCOM™ (Ultrasonic cardiac output monitor, Spacelabshealthcare®; Sydney, Australia). Values for cardiac output and cardiac index were averaged automatically by the USCOM® over 15 cycles of compression-decompression thus 15 cardiac cycles. The data were collected according to the Utstein style. Lund University Cardiopulmonary Assist System, LUCAS™ (Medtronics® Jolife; Lund, Sweden). This system comprises two parts, an upper part consisting of a pneumatically driven piston rod which squeezes the patient’s sternum via a pressure pad which is surrounded by a suction cup to provide active decompression, and a rigid back plate placed under the patient. This study was conducted using the LUCAS 2, which is powered by a rechargeable lithium battery with an autonomy of 45 minutes (two batteries are always available during the intervention). LUCAS is an active compression-decompression system in which the sternal compression phase, with a depth of 4 to 5 cm, facilitates ventricular ejection while the following active decompression phase facilitates venous return and coronary perfusion, and allows the chest to return to its initial position after each compression. It provides regular, effective massage at a fixed frequency of 100 compressions/minutes (Figure 2). This is a non-invasive, reliable, quick and inexpensive method to measure cardiac output using the Doppler technique. This technique is not the standard of care to measure cardiac output but it was difficult to use another invasive technique in the prehospital setting. A 2.2 MHz Doppler transducer is placed by a out-of-care operator in the suprasternal notch to continuously measure the systolic transaortic flow. Transpulmonary blood flow can also be recorded by placing the transducer in the right parasternal position at the level of the 3rdor5th intercostal space. The characteristics of the patient including weight, age and height were recorded for each case. Cardiac output is measured by calculating the product of the stroke volume (SV) and the heart rate, where the SV is the product of the velocity time integral at the aortic valve and the diameter of the left ventricular outflow tract, the value of which is fixed and arbitrarily incorporated into the machine. This technique to evaluate cardiac output has shown its efficacy. In the literature, it was comparable to invasive methods such as the PiCCO or the Swan-Ganz catheter [16,17]. To our knowledge, it is the simplest and quickest way to estimate cardiac output outside hospital . The primary outcome included difference between the average values (of 3 measures) of hemodynamic parameters (arterial pressure) between manual and mechanical (Lucas) chest compression. Secondary outcome included difference between the average values of cardiac output and correlation between cardiac output and other routinely-measured hemodynamic parameters, in particular the EtCO2. The number of subjects necessary was calculated on the basis of the study by Duchateau et al. ICM 2010: In 2010, Duchateau et al. investigated the hemodynamic impact of Mechanical CPR, using the AutoPulse system, compared with Manual CPR. In this study, the mean difference between mean diastolic pressure procured by Manual CPR and that procured by the AutoPulse system was 5 mmHg. The standard deviation of the difference was 8mmHg. If the mean difference between mean diastolic BP was 5mmHg, it would be necessary to include a minimum of 21 patients to reject the nul hypothesis, according to which the mean difference is zero, with an alpha risk=0.05, and a power of 80%. Given the possible technical difficulties, a total of 26 subjects were included. Qualitative variables, were expressed as medians and interquartile intervals associated with the 25th and 75th percentiles [IQR] and analysed using a Wilcoxon rank sum test for paired data. The correlation between cardiac output and EtCO2 was evaluated using the Spearmann correlation coefficient. The threshold of significance was set at p<5%. Twenty-six patients were eligible in the study period. Two patients were excluded due to the recovery of spontaneous electrical activity during the inclusion phase. Altogether, 21 patients were included between February and December 2011. The baseline characteristics of the study patients are shown in the table 1 . None of the rhythms observed at the arrival of the SMUR were suitable for defibrillation (asystole or electrical activity with no pulse). External cardiac massage or attempted massage by an onlooker before the arrival of the emergency services (fire brigade or SMUR) was given in only 38% of patients (n=8). The mean duration of «no flow» was estimated at 7 minutes (1-10). The proportion of ROSC (Return of Spontaneous Circulation) was 24% (n=5). EtCO2 monitoring and invasive measurement of arterial pressure via a femoral artery catheter was implemented in all of the patients. Finally, all of the patients were given epinephrine, in accordance with the recommendations, before the start of inclusion. Table 1: Baseline Characteristics of the study Patients. Concerning invasive arterial pressure data, the MAP recorded under manual chest compression was 30 mmHg (24-31) compared with 42 mmHg (36-47) under LUCAS®. The DAP was 15 mmHg (9-19) under manual chest compression versus 25 mmHg (16-31) under mechanical massage. 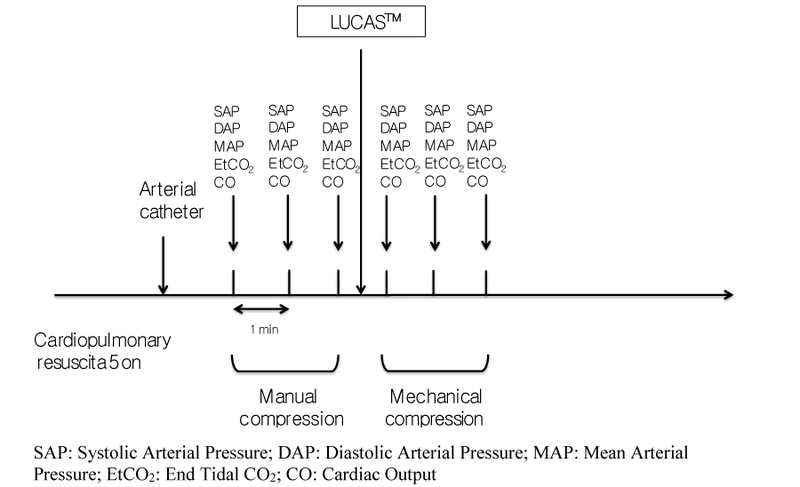 Finally, the SAP under manual chest compression was 69 mmHg (54-87) versus 88 mmHg (69-105) under LUCAS®. Differences for all of the mean values for arterial pressure were significant with p<0.0001 (Table 2). Table 2: Comparaison of hemodynamic parameters, cardiac output and cardiac index between manual and mechanical (Lucas) chest compression. Concerning USCOM® data, collected for 17 patients, under manual technique the cardiac output and the cardiac index were 4.7 l/min (4.2-5.1) and 2.3 l/min/m2 (1.9-2.5), respectively. Under LUCAS®, the mean values were 5.8 l/min (5.4-6.5) and 3.0 l/min/m2 (2.7-3.3), respectively. The above differences were significant with p<0.0001 (Table 2). Mean EtCO2 recorded under manual technique was 15 mmHg (13-17) versus 19 mmHg (16-22) under LUCAS (p<0.0001) (Table 2). 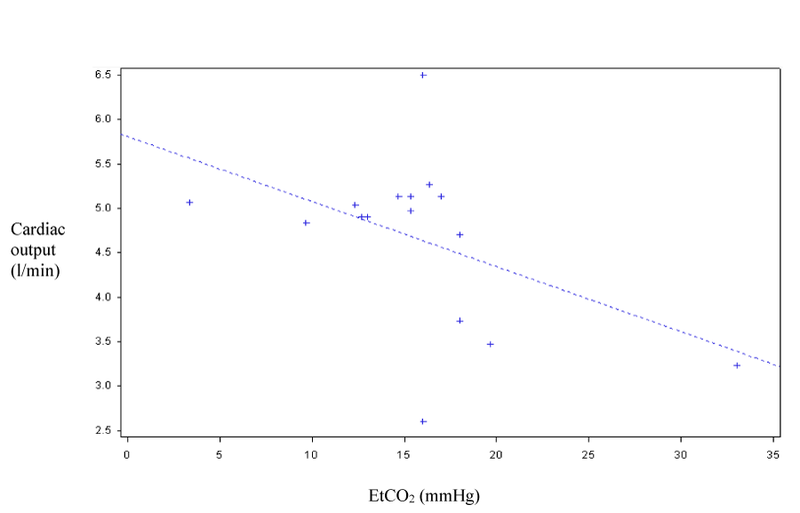 Concerning the correlation between CO, CI and EtCO2, the correlation coefficient under manual chest compression was 0.46 (p=0.069) and 0.6 under LUCAS (p=0.014). The curves shown in figure 3 and figure 4 correspond to scatter plots. Figure 3: Correlation between EtCO2 and cardiac output with manual chest compression. 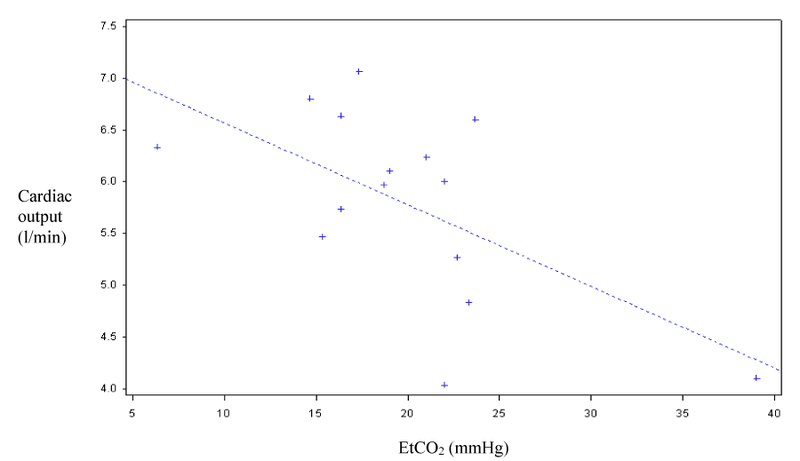 Figure 4: correlation between EtCO2 and cardiac output with Lucas™. The results of this study show that the LUCAS® active compression-decompression system was associated with an increase in the cardiac index when it was used after manual CPR. The higher values for MAP and DAP observed with the LUCAS underline the fact that this apparatus should provide better cerebral and coronary perfusion than that achieved using manual massage. The cardiac index, cardiac output and EtCO2 were also significantly greater with LUCAS than with manual massage, which could be explained by better ventricle filling during the decompression phase and more effective ejection during the compression phase with the LUCAS device. This study was unfavourable for the Lucas automatic system because it was always used second in the sequence. It is well known that the chances of recovering a normal sinus rhythm diminish with time [20,21]. Greater regularity of the compression-decompression phases in terms of both power and duration could explain the higher cardiac index values achieved with the mechanical system. With manual chest compression, the fatigue of the operator over time makes the decompression phase less effective, with reduced left ventricular filling, and the compression phase less powerful, with an ejection volume that tends to diminish. EtCO2, the best indirect indicator of cardiac output and thus the efficacy of chest compression, was also significantly higher with LUCAS. In this study, there was a satisfactory and statistically significant correlation between EtCO2 and CO with LUCAS. With manual massage, the correlation was weaker and not significant. Several factors, such as the low statistical power and the individual and inter-individual heterogeneity in massage power, could explain this lack of significance. In the literature, most of the studies on the invasive exploration of CPR efficacy are in animal models. Concerning pig models, certain authors have reported that mechanical chest compression, whatever the device, provides better coronary and thus myocardial perfusion and a greater probability of ROSC [22,23]. The same conclusions have been drawn in studies on cerebral perfusion or on cerebral blood flow, and perfusion pressures recorded in the internal carotid were greater with mechanical methods than with the manual method . In a pig model, blood flow recorded in the left internal carotid was significantly greater with LUCAS® than with manual CPR . These results suggest that mechanical chest compression, by improving cerebral and coronary perfusion, should improve the neurological prognosis and survival in patients who suffer out-of-hospital cardiac arrest. In humans, only one recent pre-hospital study compared the hemodynamic impact of the AutoPulse® system. It found significantly better parameters for invasive arterial pressure using Autopulse® . Other studies have measured coronary perfusion pressure in patients suffering cardiac arrest in the coronarography room. These studies showed that automated systems were extremely effective for coronary perfusion . The efficacy of the two cardiac massage techniques on biological parameters has also been studied. The results of a study published in 2010 showed less marked acidosis, as well as higher PaO2 using Autopulse® than with manual massage . We noted in patients with unsuccessfully CPR after mechanical CPR more ribs fractures but no difference in the incidence of sternal fractures. No CPR-related injury was considered to be the cause of the death . To our knowledge, no other studies have compared the efficacy of these two techniques by measuring the cardiac index or cardiac output. Only EtCO2 has been used as it is an indirect indicator of cardiac output. Here too, EtCO2 values during CPR were higher with mechanical techniques, suggesting better cardiac output [29,30]. This study, however, has a number of limitations, first of all, the statistical power. Even though the differences were significant, the number of patients analysed (n=21) was small. This low statistical power could also explain the low correlation coefficient for EtCO2-CO, as well as the absence of significance with regard to manual massage. In the literature, studies that evaluated the correlation between CO and EtCO2 reported coefficients close to 0.8 . The second limitation was the technique used to evaluate cardiac output, namely the Doppler method, which is known to be operator-dependent. This bias may have been partly counterbalanced by the small number of operators; only two persons measured output data. Finally, it would have been useful to assess the incidence of the delay to initial care (no flow) on the different hemodynamic variables. It is likely that the longer the duration of no flow, the greater the level of acidosis, which could affect hemodynamic variables. To assess the impact of this delay on arterial pressure and cardiac output, arterial blood samples could be taken during mechanical and manual chest compression. The only data in the literature on this point are based on arterial lactatemia values after the return of spontaneous circulation. Lactate levels could not be measured during the massage in the present study given the interventional nature of such sampling techniques and the need for additional authorisations, which would have made it impossible to classify this study as routine care as initially defined by the ethics committee. At this moment, we noted no evidence of improvement in survival with LUCAS® compared with manual compressions . But this device may be a good alternative to manual compression during a patient transport with ongoing resuscitation . According to the most recent recommendations ILCOR 2015 , the automatic CPR provided by the Lucas system is indicated for the transportation of patients being transferred to a centre specialized in circulatory support following intoxication with B blockers. The hemodynamic performance of the LUCAS® compression-decompression system is, according to these results, better than that of manual CPR. The data from this study corroborate data in the literature on the same subject. According to current knowledge, automated systems for external cardiac massage (Autopulse® and LUCAS® for France) provide hemodynamic benefits thanks to the quality of the massage and ensure better cerebral and myocardial perfusion for a longer period of time. Nonetheless, even though the benefits have been demonstrated for physiological data, no human studies have clearly shown that automated systems improve survival, or the neurological prognosis or the proportion of ROSC [31,33]. Prolonged cardiac massage is still the only indication for the use of these devices. Obtaining optimal hemodynamic parameters is also essential to achieve best possible tissue perfusion in the case of graft harvesting in cardiac arrest, or the decision to initiate circulatory assistance during coronarography .